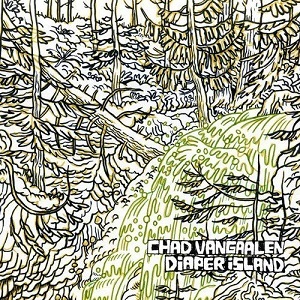 Chad VanGaalen reigns from the Great White Northerness of Calgary, Alberta. He does his recording in a home studio called, playfully, "Yoko Eno." His music is multi-layered and charming. It feels almost effortless. VanGaalen, like any studier and creator of music, displays a strong awareness and fondness for music's past in each of his songs, but what he has also succeeded in doing is touching all the bases required to stand up to bands like Animal Collective and Grizzly Bear. His music is enveloping, but pop-aware. And it goes beyond mere serviceability by infusing brilliantly complex production and electronic and dream-pop elements that enhance each track. His newest, Diaper Island, is alive with those notions. VanGaalen is able to hit the design notes of Brian Wilson, Lennon/McCartney, and Costello, while still constructing sonic buildings that are of their own genre. By using sparse and clattering guitar tones, amid many washing walls of echo, fuzz, hush and reverb, VanGaalen seems driven to nearly bury the hooky pop he has written, but leave it in a shallow enough grave that it can claw back out and surprise. (Yes, like a zombie.) And all the while, Diaper Island surprises on another level. Songs like "Heavy Stones" come right out of the Ryan Adams Heartbreaker realm, suddenly so delicate and natural, lacking all the electronic adornment and flourish of earlier tracks like "Peace On The Rise" and "Burning Photographs." It works, too, in part because VanGaalen doesn't leave one song hanging out there. After that, he presents "Sara," a song that feels beautifully Fleet Foxian, with a touch of Crosby, Stills and Nash. It's another beautiful natural track that fits so perfectly, while elegantly lifting the pace and setting the tone for further experimentation. That set of tone is essential. The crunchy and energizing "Replace Me" follows and fills in all the pastoral openness of the previous two tracks with a healthy dose of fuzz, pounding drums and screaming reverb. It's an amazing lift. A jolt of caffeine after a calming hike. And it is followed by the psychedelia of "Blonde Hash," swirling with repetitive chants and grungy guitars. And post-trip, it's a speedy, pop-gasmic '60s-esque track called "Freedom For A Policeman." "Can You Believe It?" adds a massive spoonful of space-rock to the situation, loaded with powerful echo and crunching speedy riffs. Plus, there's some hilariously wonderful lyrics. In mastering all of these genres, and capturing them so perfectly while adding his own flavor, VanGaalen concocts one of the most eclectic and immediately charming albums of the year. It is bombastic and frenetic, darting from thought to thought and style to style, but in that it succeeds so spectacularly each time, that kind of "aimlessness" becomes enjoyable and very much desirable. If you enjoy the bands I've mentioned before, Neil Young, My Morning Jacket and other purveyors of great folk, power pop, and effects-heavy guitars, this is an album you must hear.